Tokai Region is relatively warm with the longevity of four seasons almost equal, enabling you to enjoy autumnal tints for a long time. Kinki Region embraces Kyoto, where “leaf peeping” has been held since Heian Era; there is history in each spot famous for autumnal tints. For the leaves to turn into vivid colors, you need temperature difference between night and day as well as long duration of sunlight; Tokai and Kinki regions are blessed with environment suitable for autumnal tints; therefore offer several perfect sites for autumn colors. 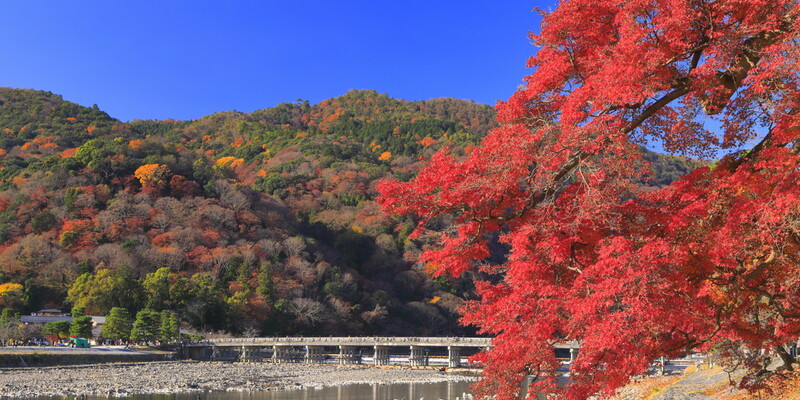 Korankei, a gorge created by Tomoe River, is a representative spot for autumnal tints in Tokai Region, offering a splendid landscape of about 4000 maples and Japanese maples. It all began when San-ei, the successor of Kojakuji Temple, planted Japanese maples and cedars in the precincts and the approach in Edo Era; later, the local residents continued planting trees in the approach along Tomoe River, thus completing the current form. Within the gorge, you will find 11 species of Japanese maples and mountain maples; the leaves with slightly different tints create a beautiful gradation of yellow, orange, and red. In particular, the approach’s “Japanese maple’s tunnel” and scenery around Kojakuji Temple and Taigetsukyo Bridge are amazing spots. 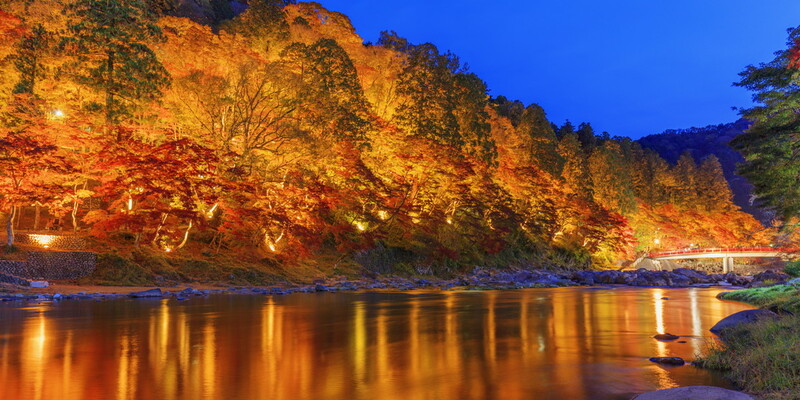 At “Korankei Momiji Matsuri,” a festival held every November, when the leaves are illuminated, the gorge offers a landscape of blazing tints. Located at the base of South Alps, Sumata Gorge is known as a site offering lovely scenery throughout the year. Especially in the season of autumnal tints, maple, beech, and oak leaves turn into vivid colors, showing off a gorgeous contrast against the cobalt blue river surface. 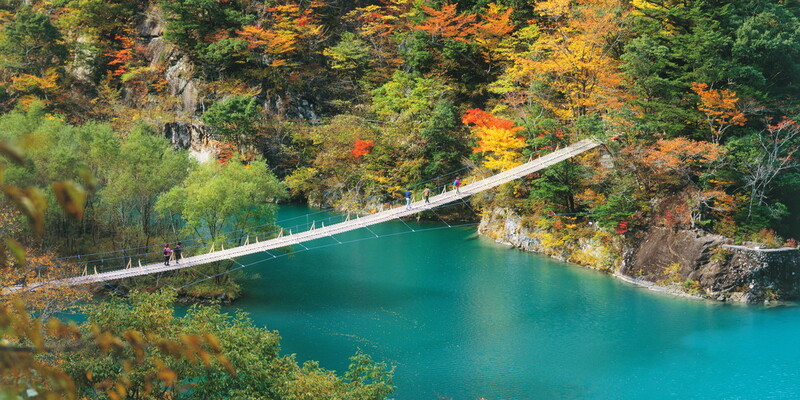 A promenade is provided along the gorge starting from Sumatakyo Onsen; from “Yume-no-tsuribashi Suspension Bridge,” a 90 m long bridge over a reservoir on the way, you can appreciate up close the autumn leaves covering the tangled rocks. Hiryu-bashi Bridge, which was once a logging railroad, and Ozaki-zaka Observatory are also perfect spots for enjoying autumn leaves. “Yume-no-tsuribashi Suspension Bridge” is one of the “Top 10 Suspension Bridges You’d Like to Walk Before Dying,” and a highlight that leaves a strong impression whether you walk on or look at." Mt. 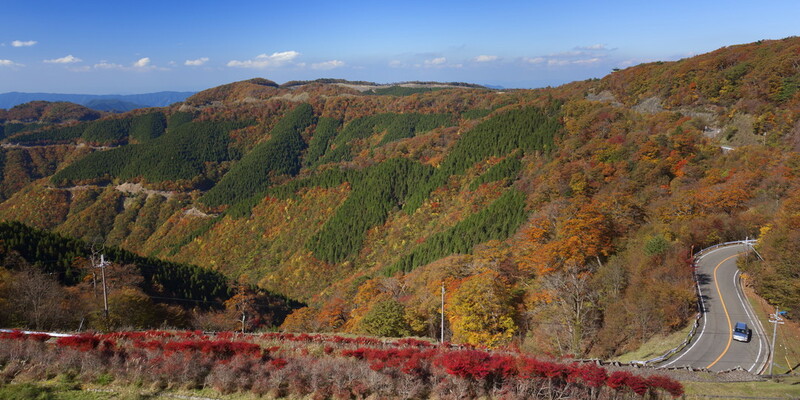 Yoshino consists of ridges of about 8 km long that stretch between south of Yoshino River and Omine mountains. It is also a divine place of mountain worship with shrines and temples centering on Kinpusen-ji Temple (world heritage) scattered. It is a nationally famous scenic spot for cherry blossoms in spring, but autumnal tints are also worth seeing. Wild cherry trees, which are seen all over Mt. Yoshino, are known as species that turn into beautiful red. Maple leaves mingle the wild cherry leaves, turning the mountain surface into red, yellow, and orange in autumn. The landscape where mist covers the mountain surface and bank of clouds hang is particularly amazing. Kinpusen-ji Temple halfway up the mountain is also full of highlights, and its Zao-do (main hall) which is designated as national treasure has an overwhelming presence. The precincts is filled with immaculate air, and you will feel energized at a spiritual site representing Japan while enjoying autumnal tints. You will find the avenue of Metasequoia stretching about 2.5 km between the road connecting Makino Pickland (tourism orchard) and Makino Highland. Metasequoia is an upright cone-shaped conifer which turns its leaves into yellow and red. It was considered as an extinct specie, only to be discovered as fossils; however, a seedling was imported to Japan after it was discovered in China in Showa 20 (1945). 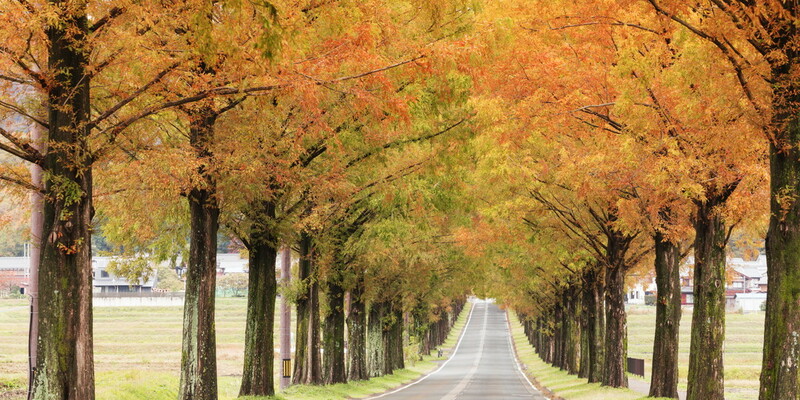 About 500 Metasequoia trees were planted along the linear road, offering a symmetrical roadscape which is rare in Japan. The autumnal tints of this site presents an open splendor, different from Japanese maple leaves’ red. It feels great when driving through by car, but you would like to enjoy without haste by walking through. The valley which stretches about 4 km upstream Taki River is dotted with numerous waterfalls, big and small. This location used to be a divine place of mountain worship in the past; there is still an expression “Taki-mairi (making a pilgrimage to waterfall in the valley)” in the local area. 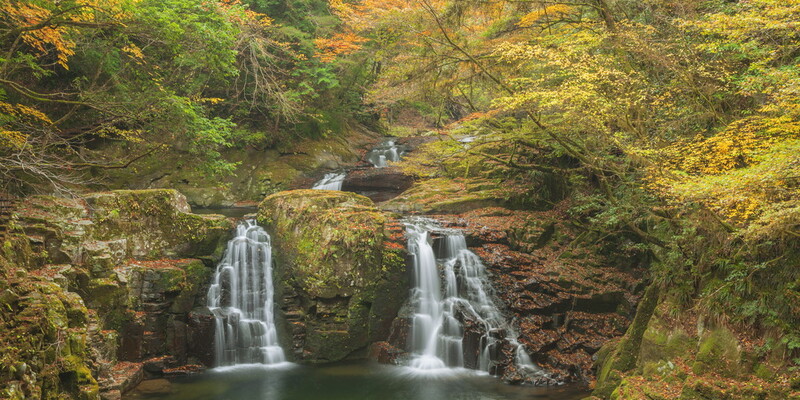 In autumn, a variety of deciduous broad-leaved trees such as Japanese maple, maple, Japanese sumac, konara oak, wild cherry decorate the waterfalls and pure torrents glamorously. Trees near waterfalls present a more vivid autumnal tints, probably because it’s colder at night and temperature difference is significant. Among numerous waterfalls, we recommend watching “Akame Gobaku,” the five major waterfalls such as “Ninai,” a waterfall with 8 m drop flowing from both sides, and “Nunobiki,” with 30 m drop. You will feel refreshed as you walk the promenade for waterfall-hopping and enjoy negative ions and autumnal tints. Koya-ryujin Skyline is a highway offering panoramic view of 42.7 km, connecting Mt. 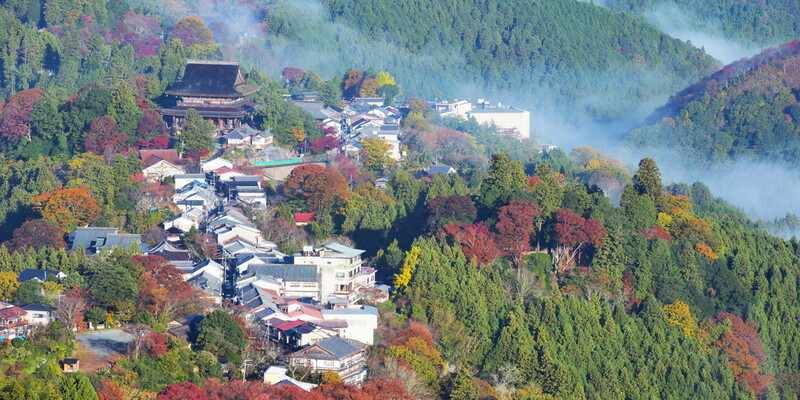 Koya, the divine land of Shingon Mikkyo Order and Ryujin Onsen. Since it is a route following the ridge trail, it offers an amazing landscape; you can enjoy a pleasant drive watching autumnal tints of Mt. Gomadan (elevation 1372 m), also called the roof of Kishu Region and Iohara Valley (elevation about 1000 m). At the peak of autumnal tints, the primeval forest of beech covering all over Mt. Gomadan turns gold, with Japanese sumac and rowan trees adding red pigment. At Iohara Valley, the yellow of primeval forest of beech shows a balanced contrast against the green of Japanese sumac and coniferous trees. The view from “Gomasan Sky Tower,” a 33 m tower located at the midpoint of Koya-ryujin Skyline is also fine; you can look over the seascape of Kii Channel beyond the layered mountains. Arashiyama has been a scenic retreat for aristocrats since the Heian Era, about 1200 years ago. They say these nobles viewed the mountains in autumn color while indulging in elegant boating. You will find Togetsukyo Bridge, the symbol of Arashiyama, over the pure stream of Katsura River; Arashiyama, a place with poetical associations, is on its west. In autumn, the tints of maple, Japanese zelkova, and wild cherry leaves show a mellow contrast against the green of Japanese red pines, attracting many visitors as a autumnal scenery representing Kyoto. The attractive autumnal scenery can also be found in other mountains; nearby is a chain of breathtaking autumnal tints such as the garden in Tenryuji with borrowed landscape of Arashiyama, Jojakko-ji Temple decorated with maples, Nison-in Temple famous for “Momiji-no-baba,” and Houkyouin Temple whose precincts is covered with autumn leaves. At “Arashiyama Momiji-matsuri,” a festival held on the second Sunday of November every year, traditional performing arts such as Kyogen will be presented on the boat and by the river.